Edward Wormley was the primary designer for the Indiana-based furniture manufacturer Dunbar from 1931 to 1967, responsible for securing Dunbar’s reputation as a leader in modern American furniture production. In January of 1932 Dunbar released Wormley’s first pieces which were authentic adaptations of historical forms including a Chippendale sofa in the collection of the Metropolitan Museum of Art. Just months later in June 1932, Wormley introduced his first modern designs of two chairs and by 1944 he had redirected Dunbar’s output to be utterly modern in style. Over the course of four decades, Wormley developed a finely crafted line of pleasingly simple furniture that would adapt well to a range of interiors and most importantly, be livable and comfortable. In 1945, he opened an independent design studio in New York, where he produced his own furniture alongside maintaining his contract with Dunbar for furniture and textiles and also carrying out other interior and product design projects including lighting for Lightolier, globe-stands for Rand McNally, and fabrics for Schiffer Prints. MoMA featured more than two dozen of the designer’s furniture pieces in its 1950, 1951, and 1952 “Good Design” exhibitions. This chair is in achievement in delicate proportions and clean lines. Wormely’s interest in Chinese design can be identified in the chair’s form that references the traditional Chinese horseshoe chair with its rounded back and arms, as well as in the designer’s choice of caning, used for chair seats in China since the Ming dynasty. The chair’s visual warmth is heightened by the bright hues of the Jack Lenor Larsen fabric that covers the chair’s seat cushion. Wormley and Larsen met in 1951 when Wormley sent an assistant to Larsen asking him to design a curtain for a model room. Since then, the two remained close friends and Wormley was a continual client, engaging Larsen to design textiles that added a visual punch to his seating furniture for Dunbar. 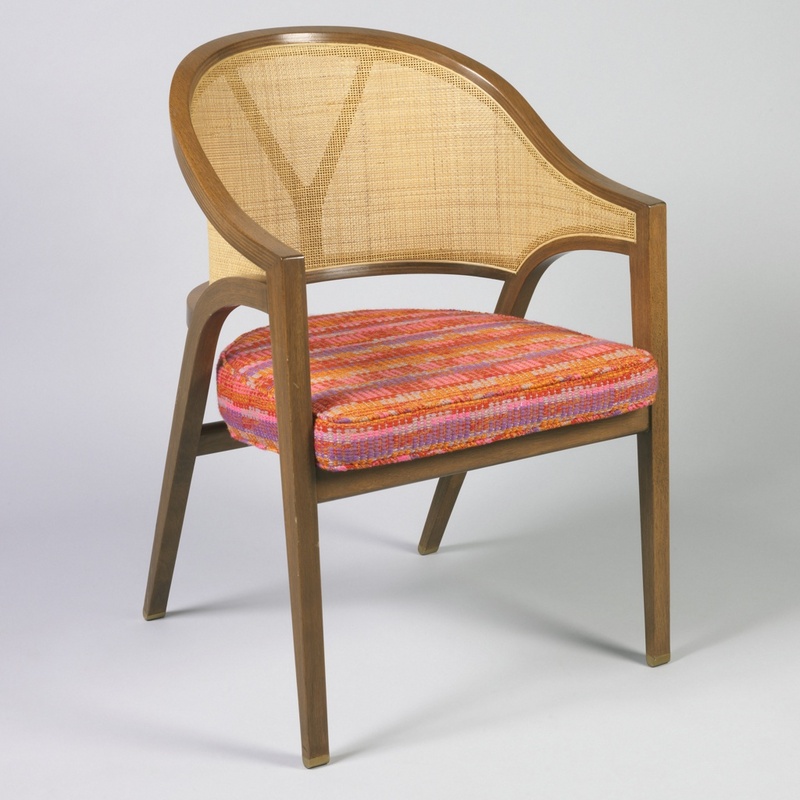 Armchair, 1959; Chair designed by Edward Wormley (American, 1907-1995) and manufactured by Dunbar Furniture Co. (Berne, Indiana); Textile designed by Jack Lenor Larsen (American, born 1907); Laminated walnut, caning, woven wool upholstery; Gift of Dunbar Furniture Co., 1971-20-3.